The Annex @ Brewerytown offers the finest urban apartments in the Brewerytown neighborhood of Philadelphia, Pennsylvania. Experience the luxury, comfort, and excitement of our apartment community, which features amenities that are designed with your unique lifestyle in mind. Our residents enjoy stylish, newly constructed interiors that come fully-equipped with state-of-the-art appliances, hardwood floors, and an in-home washer and dryer, all providing a personal touch of modern comfort to enrich your daily routine. But the benefits don’t stop at your front door! 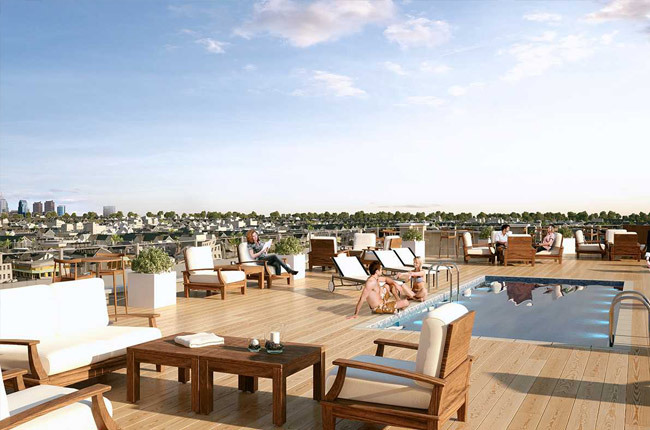 There is more to enjoy throughout our property with community amenities such as a rooftop swimming pool and expansive poolside deck where you can bask in the sunshine on a beautiful day or spend a cozy evening gazing at the moon over the city skyline. If you’re searching for the most vibrant apartment living experience, look no further than the Annex at Brewerytown. Here, home isn’t just a place – it’s a state of mind. Our location in the heart of Brewerytown takes urban living to the next level. Whether you’re searching for shopping, dining, or entertainment, the best options that Philadelphia have to offer are awaiting you. With a nearby Trader Joe’s, Aldi, and Whole Foods, all of your favorite shopping spots are within reach. If you want to spend the day in the sunshine, look no further than Fairmount Park, a scenic green space right down the street that provides plenty of walking trails and sports fields as well as beautiful gardens, public art, and a reservoir for nature lovers to enjoy. Less than a mile away, the enthralling works at the Philadelphia Museum of Art offer endless exhibits to explore. With Center City, Northern Liberties, and Fairmount all conveniently available right outside of your front door, The Annex @ Brewerytown brings the whole city to you!